Chris Sommers of Pi Pizzeria is not backing down, and according to a statement published by Riverfront Times, he is adamant about holding the St. Louis Metro Police Department accountable for its officers’ actions—no matter what smear campaigns or death threats they throw at him. Sommers noted that he was first alerted to the protests while monitoring Twitter. When he saw reports of protests after it was announced that Police Officer Jason Stockley was acquitted of the killing of Anthony Smith—despite evidence that Stockley initiated a dangerous police chase and then planted a gun in Smith’s car—Sommers said he attempted to help calm the tension. “I immediately jumped in my car and called our manager, asking him to get waters ready to hand out to all police and protestors as they walked by, in an attempt to calm nerves and prevent damage to my building,” he wrote, noting that the protests were peaceful and they lasted for about an hour. After Sommers determined that the scene had calmed down, he said he left the restaurant and started his drive home, where he encountered a wall of militarized police officers “marching by themselves with gas masks, guns and shields,” despite the fact that there were no protesters in sight. While the video of this scene does not appear to have been released publicly, its existence holds substantial weight. Sommers claimed he is now working with the American Civil Liberties Union, and plans to testify before a federal judge. Sure enough, the Blue Lives Matter website criticized Sommers in an article claiming he was “supporting the rioters even as they tried to set his restaurant’s plants on fire.” However, it failed to mention that Sommers and his staff offered water to everyone—protesters and police—and the report of someone trying to set his plants on fire was based off the actions of one man, not an entire group of protesters. “Let’s get the word out that if you bash the police, you won’t be getting our business,” Blue Lives Matter concluded. 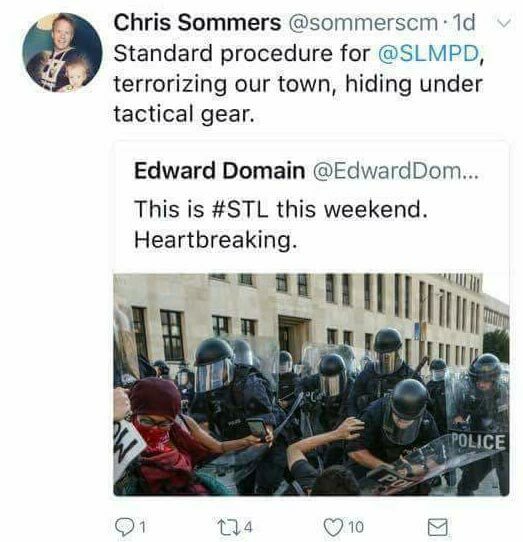 Sommers claimed the union representing the St. Louis Metro Police Department also posted his and his employees’ phone numbers on its Facebook page, and as a result, they have been threatened and harassed. Sommers noted that he has had a history of supporting police through his business, including letting officers eat for free of for 50 percent off every time they dine in uniform, and he has also donated to their non-profits and events anytime he is asked. As he deals with a barrage death threats, Sommers is responding by asking the public to support him by attempting to combat some of the negative reviews hundreds of “Blue Lives Matter” supporters have left on Yelp, Google and Facebook, attacking his business. However, just as police officers were marching through the streets of St. Louis, chanting “Whose streets? Our streets!” it appears that there are far too many people who believe them. If an individual sincerely believes that when a business owner defends his restaurant by calling out to police to stop indiscriminately targeting his customers, he is automatically someone who hates police, and should receive death threats, that individual should seriously reconsider his or her line of thinking. If one claims to “support” police officers, the best thing they can do is to hold those officers accountable for these actions, instead of following them blindly with no oversight. Thursday evening, Sommers summarized this week of hell brought directly to him by those sworn to protect.